If you have a small kitchen you know the struggle of storage space and how important it is to make use of the space you already have. There are many ways you can save space and add additional storage without feeling like your cooking space is getting crowded. You may find that a showroom featuring kitchens in North Wales and the UK present innovative storage ideas, but storage is still an issue if your kitchen is half the size. Below we have listed five space-saving ideas for your little space, to ensure you get the most out of your kitchen. First up is a single-bowl sink. These are not the modern-style sinks you get in kitchens these days, but they can save you a foot or more of counter space. There are various styles you can get of these sinks, which means there is one out there to suit your kitchen. Another way to save space is to eliminate the unnecessary elements in the kitchen that are preventing you from having space, such as removing the door. Replacing the door with a nice, clean archway will open up the space. You will get more light, space and there will be no worries about someone trying to open the door with no space to enter. Wall-mounted storage is another option, and enables you to utilise the space you already have. 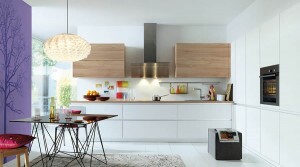 You can buy simple rails to place onto a panel which can hold saucepans, herbs, tea towels, utensils and much more. You can get various fixtures for your kitchen, which means the possibilities are endless. Another storage idea is a design that has been well used over the last couple years and that is pull-out storage. The width of these pull-out storage containers is not much and usually sits beside your fridge or in-between cupboards. These are wide enough to store tins, jars, spices, small boxes and other items we tend to store in our cupboards. Lastly we have floor-to-ceiling cupboards. Many kitchens have cupboards under counters, with smaller cupboards that sit on the wall at head-height. Although this is a typical design in our kitchen space, we can make do with more. Utilise all the space you have in your kitchen by installing a cupboard that reaches from the floor straight to the ceiling. You are guaranteed an extra-large shelf or two smaller shelfing areas to store more items. Richard Williams Builder’s Merchants are proud to be stocking the extraordinary Thistle Magnetic Plaster from British Gypsum. It is now available to order from both their branches in Llandudno Junction and Ruthin, so simply pop in and chat to one of their friendly staff or contact them on 01492 583423 for Llandudno Junction and 01824 702475 for Ruthin and they can order it in for you. For those of you who have not yet encountered the wonders of Magnetic Plaster you are probably wondering exactly what it is and what makes it so special. Magnetic Plaster is an innovative product from the renowned British Gypsum to help make homes and commercial spaces more interactive. It is essentially a finish coat plaster that contains certain properties which allow it to attract magnets. The possibilities for application are endless but the most popular use for magnetic plaster since its launch is to design interactive areas in living spaces. The Thistle Magnetic Plaster provides a smooth, inert and high quality surface which attracts magnets. The surface can be an internal wall or even a ceiling if it takes your fancy. It is a perfect base for adding creative decorative finishes. The product is a retarded hemihydrate, pre-mixed gypsum plaster. All you need to do for its preparation is add water, it is very easy to use. 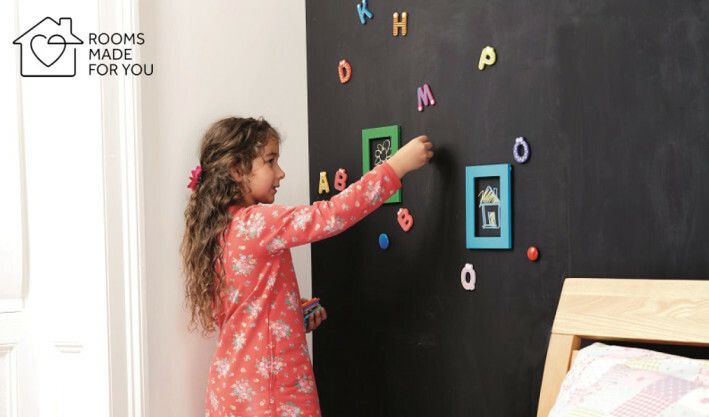 Magnetic Plaster has become highly popular in schools to create interactive learning environments and in many other learning centres such as zoos or anywhere with an educational display. It is also making its way into office spaces for development planning meeting and demonstrations. In the home the addition of a magnetic wall makes a great play time for the kids, it can also improve your creativity and increase planning room in your home office or study area. You can even just use a Magnetic Wall to create a stunning beautiful space in your home that can be easily changed to express the artist in you. Thistle Magnetic Plaster coverage is 5.1m2 for 3mm coverage and is sold by the bag. It is recommended by the manufacturer that you aim to get the plaster on between 3mm and 6mm thick. It is important to be aware that any thickness less than that will result in a less effective product. If you make it much thicker it will not be more magnetic just a waste of material. 3 – 5mm is optimal. Is it Easy To Apply? The Magnetic Plaster is easy to customise and you can paint it any colour you like. When it first goes on it will be a very dark striking black but when dry it fades to a dark grey which is very easy to cover with paint and this won’t affect its magnetic quality. It is important to let it dry fully so it becomes hard and durable. Try not to touch it while frying as it will not yet be hard and is easily marked. You can also choose to put wallpaper over Magnetic Plaster but this will lessen the effect of its magnetic properties. It is as easy to cover as Multi finish and as hard as Multi finish when dry. Keep in mind that the product should not be worked to a polished finish. Magnetic Plaster is dry. These will have no adverse effect on the decoration and will be covered by normal paint application. British Gypsum is the UK’s leading manufacturer of interior lining systems. With a very long history of experience in the world of plaster they have made it their mission to develop incredible, smart products that improve everyday life from their Magnetic Plaster to their sound proofing and lifestyle walls. The British Gypsum research, development and test facilities are among the best in Europe and this is why Richard Williams are so pleased to stock the most creative projects from this top manufacturer. You will never have to use Blu-tack or drawing pins again, which is fantastic as we all know these can leave a mark and ruin the look of your walls in time. Why Not Just Buy Magnetic Paint? Magnetic paint is not nearly as strong or magnetic as Magnetic Plaster and it is only available in a small number of colours. Click here to head to Richard Williams and find out more about the applications for Magnetic Plaster or see the product in action on their Youtube Channel.